(11 a.m. EDT) -- Viking Ocean Cruises took delivery of its fifth cruise ship today at the Fincantieri shipyard in Alcona, Italy. The 930-passenger ship is identical to its fleetmates, Viking Star, Sea, Sky and Sun. 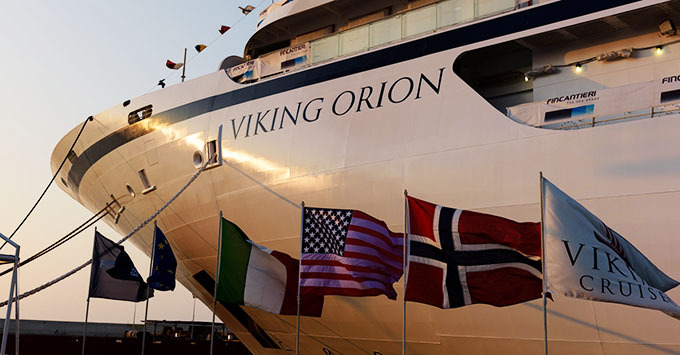 Viking Orion, like the rest of the Viking Ocean fleet, has all-balcony staterooms, multiple dining venues included in the cruise fare, two pools, and a spa with a free thermal suite that features a sauna and snow grotto. It will sail to a wide range of destinations including the Mediterranean, Australia & New Zealand, Alaska, Asia and South Pacific. The sixth ship in the fleet, Viking Jupiter, floated out about a month ago.